Do you always feel like the DIY work is boring, not attractive or no vitality when you design it by yourself? 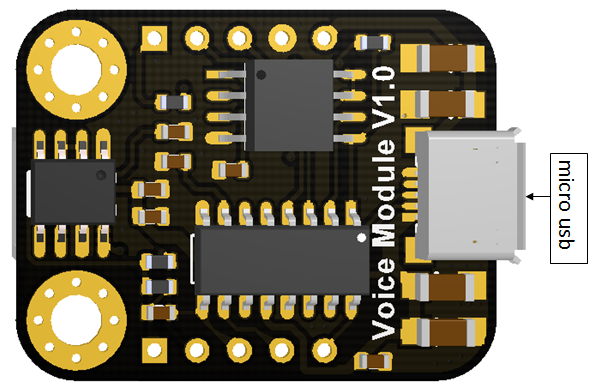 This new voice module produced by DFRobot can solve these problems. This module can store 8M audio files, which means it can store more than 200 audios for your choice. Its storage method is as simple as USB flash drive, and audios can be updated at any time. It uses the DF-Gravity interface, free from wiring; It has the ability to play the specified audio, play in loop, and adjust volume. It is suitable for all kinds of projects related to sound or voice, such as intelligent car, meteorological stations, smart home devices, vehicle navigation, toll stations, safety monitoring, machine audio navigation and so on. Explanation: You can check the play status at any time. Explanation: Play the current track from the beginning at any time. E.g. AA 07 02 00 08 BB will specify to play the eighth audio in the current drive, and the audio number is from 1 to 65535. It can check the current online drive. It is recommended that you check the current online drive before switching the drive. Explanation: It is drive switching command. If the current drive is online, you can switch it to the corresponding drive and wait to play. After switching, the module plays the first audio of this drive. It is recommended to check whether the drive is online before you switch. Explanation: The first audio in the folder will be played after switching. Explanation: This command can end the current operations in advance. If the command end a cut-in, it will end in advance and return to the original status. Explanation: It is the sequence number of the first audio. Explanation: This number does not contain the number of files in subdirectories. Explanation: AA 13 01 14 D2 Set volume to level 20. E.g. AA 16 03 00 00 09 CC Cut-in the 9th audio in the USB flash drive. Explanation: Continue to play the original audio when cut-in audio is played. Explain: This command is only valid when the loop mode is Full Loop, Single Loop, Catalog Loop. E.g. AA 19 02 00 06 CB Repeat 6 times. Command: AA 1B Upper-byte of the audio 1, Lower-byte of the audio 1...Upper-byte of the audio n, Lower byte of the audio n.
Explanation: The combination of file names is very convenient, more accurate than combined file numbers, and is not restricted by the copy order limitation. Explanation: End combination playback, and return the play state before the combination. Explanation: Start to send playing time, Return automatically when the time is updated. Explanation: End the playback time sending. 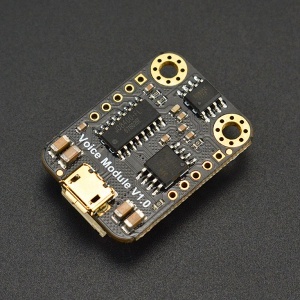 The module has built-in audio, if you need to add or replace audio, please use the micro usb to connect to the computer for updating. 2. The way to update the audio is the same as USB flash driver. 3. 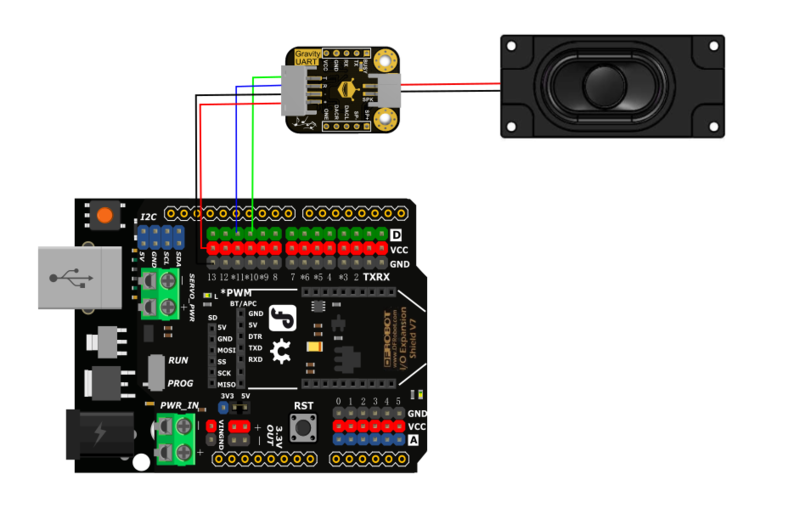 This module supports MP3 and MAV format audio files. 4. The file should be stored in the "ZH" folder and it is recommended to represent files with numbers. 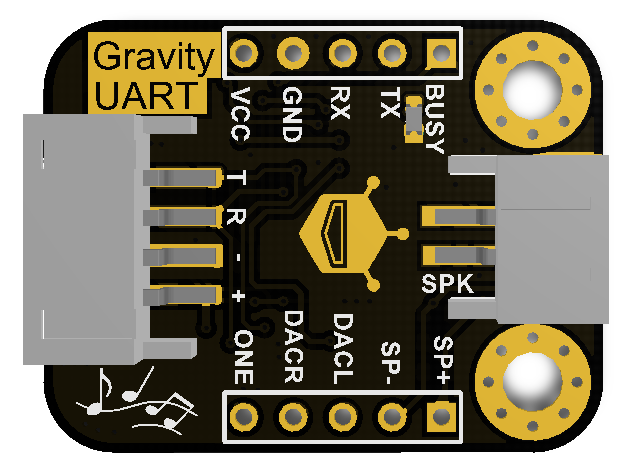 Such as 01.mp3,02.mp3, two letters or one Chinese character are also OK.
Get Gravity: UART MP3 Voice Module from DFRobot Store or DFRobot Distributor.